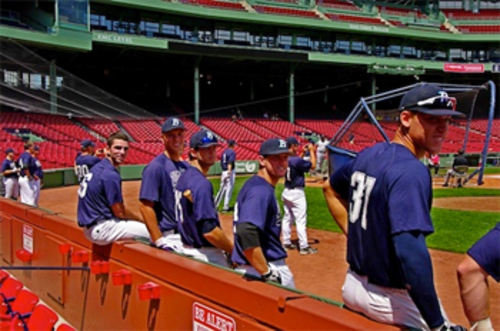 Greeted by a large, welcoming electronic sign in center field, the 2012 Cape Cod Baseball League teams gradually filed onto Boston’s most beloved ballpark on Wednesday, July 11 for the annual workout day at Fenway Park. The field was quickly manicured and mic tests rang through the otherwise peaceful morning at the ballpark, while major league scouts took their seats alongside the first baseline to observe some of the most talented athletes in the next generation of Major League Baseball. As the players began to stretch and prepare for a day of potential foreshadowing for their own debut on a major league field, their emotions and excitement ran high. The day consisted of timed running as well as infield and batting practice for each team, and as the approximately fifty scouts continued to look on and each team ventured further into their workout session, the players’ focus did not lessen. The day might have been the sole opportunity for some of the Cape League players to workout at Fenway, as the All-Star game, which has been played in Boston in recent years has been moved back to Cape Cod and will be played at Harwich on July 28. Yet, with the strong presence of major league scouts, as well as the prestigious reputation of the Cape League, there is a good chance that many of these athletes will make it back to Boston to perform on the major league stage.